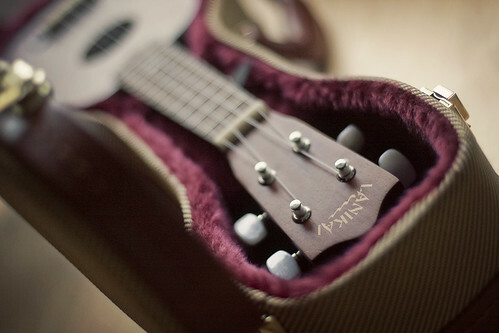 I have my first official ukulele lesson tonight. I'm nervous and excited at the same time! So far I've only been learning stuff through a couple of books I bought, and I'm curious to see how much that has taught me (which, in actuality, may be very little). Honestly, I'm really looking forward to having ukulele "homework" as opposed to just playing the same things over and over from the books I've been using. I can't remember the last time I've looked forward to having homework. Yay for learning! I also just signed up for BlogHer Food 2010. In October. So this is probably the first and last time I'll mention it until it gets closer to October. Actually I may not mention it again. As much as I like going to those events, I'm so incredibly terrible at introducing myself and networking with people that I probably shouldn't even mention I'm going. Maybe, if you're there, just wave hello to the bitter, old blogger sitting in the corner, 'cause there's a good chance it'll probably be me. \n\n\nI have my first official ukulele lesson tonight. I'm nervous and excited at the same time! So far I've only been learning stuff through a couple of books I bought, and I'm curious to see how much that has taught me (which, in actuality, may be very little). Honestly, I'm really looking forward to having ukulele \"homework\" as opposed to just playing the same things over and over from the books I've been using. I can't remember the last time I've looked forward to having homework. Yay for learning!\n\nI also just signed up for BlogHer Food 2010. In October. So this is probably the first and last time I'll mention it until it gets closer to October. Actually I may not mention it again. As much as I like going to those events, I'm so incredibly terrible at introducing myself and networking with people that I probably shouldn't even mention I'm going. Maybe, if you're there, just wave hello to the bitter, old blogger sitting in the corner, 'cause there's a good chance it'll probably be me.